Escape the winter chill with the best doonas, duvets, and quilts in Australia. You don’t even need to step outside – these will all be delivered to your door. Who needs to go outside in winter if you’ve armed yourself with one of Australia’s best quilts? Shun the outside and snuggle up under a cosy, warm duvet instead. You don’t even need to leave your house to get your hands on one of these. Whether you’re a fan of natural fibres, sleep hot, feel the cold or have allergies, we’ve rounded up the top quilts in Australia. We’ll guide you through the best choice for you with our top picks that have been informed by hours of research and input from bedding experts. Choosing the best duvet is a big ask. So, we started big and turned to the web. We wanted to see what quilts were loved around the world. From there, we narrowed down quilts that were available in Australia. Which basically sent us back to the drawing board. Next, we checked Choice, Australia’s consumer advocacy group, to see what they had tested and recommended. The answer? None. 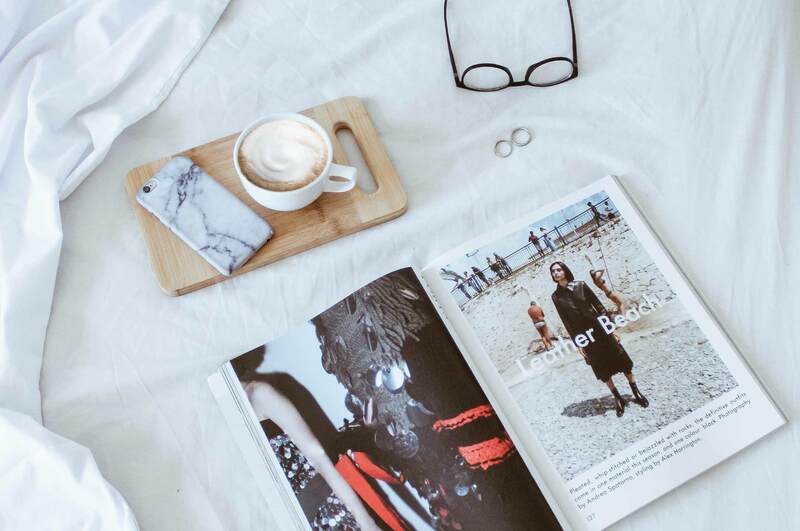 Which led us to seeing what Aussies love and recommend. We used ProductReview.com.au to find highly rated quilts that are popular in Aussie bedrooms. We looked for products that covered a wide range of prices and materials. We were also interested in locally owned and operated companies to allow you to support local and reap all the sustainable and community benefits of this. What we ended up with is a list of picks that we love, rather than being definitively the best. Quilts are subjective: one human’s love for a heavy wool quilt is someone else’s no-no. So, we’ve aimed to present a selection of materials and prices to help you choose what could be right for you. 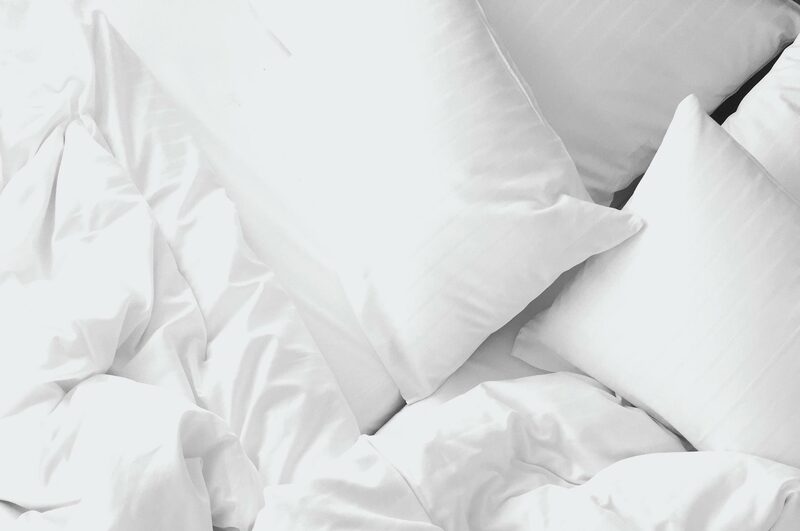 In our What to consider when buying a quilt, duvet or doona section, you might notice we’ve got some expert input from Debbie Farrell, Bedding Buyer at Pillow Talk. We consulted her separately for her professional advice, and she didn’t influence, review or have any say in our top picks. Here are our top picks for the best quilts in Australia. We felt we had to mention these very special quilts. For starters, they’re filled with 100% Australian wool grown on local farms on local sheep. The manufacturing process is entirely Australian. This is from the cleaning and carding (which produces a continuous web or sliver) in Geelong, to the on-site crafting on their farm in Boort, North Central Victoria. You get a fantastic choice with Aussie Wool Quilts. This includes dry clean only or washable options, plus varying thicknesses. To make it easy, you choose thicknesses equivalent to 2, 3 or 4 blanket warmth – no more confusing gsm or tog count. Get cold feet? They’ll pad out the bottom of your quilt with extra wool – just ask. They even offer Duo quilts, where each half of the quilt has a different warmth factor. All their quilts are encased in 100% cotton and are chemical and allergy free. You can even customise your quilt to your exact measurements. With all of this, you might think Aussie Wool Quilts are scarily expensive. In our opinion, they’re not. They range in size from cot to super king and from just over $100 to almost $450. A queen quilt in 2 blanket warmth costs just under $300. 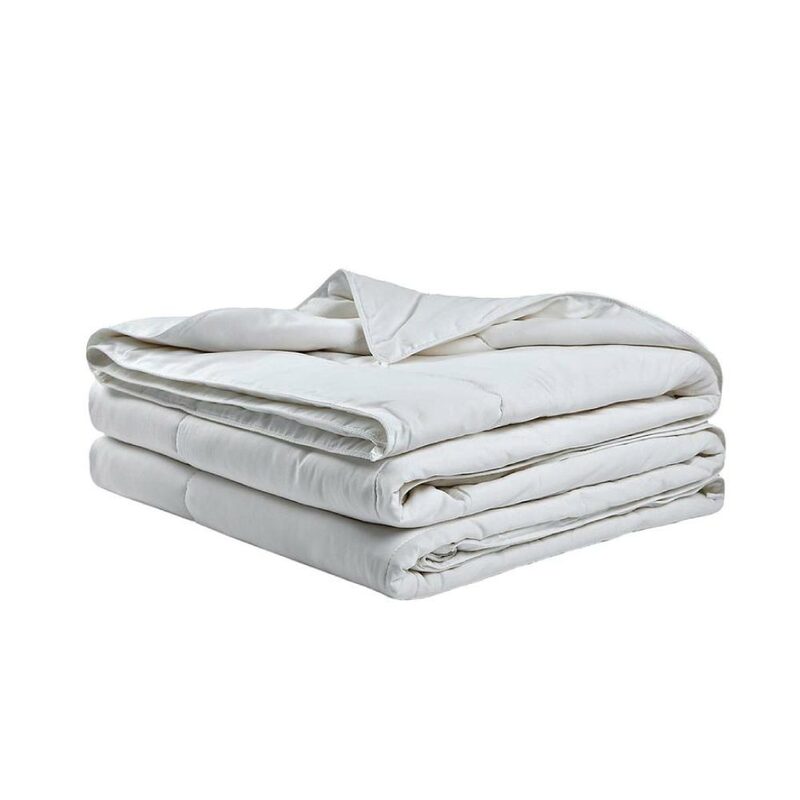 Which is a large outlay, but customer testimonials on ProductReview.com.au attest to the quality and long-lasting nature of these duvets. They’re a real investment. Sustainable, Aussie-made, great for allergy sufferers, fully customisable, top quality, warm and toasty – what else could you want in a quilt? 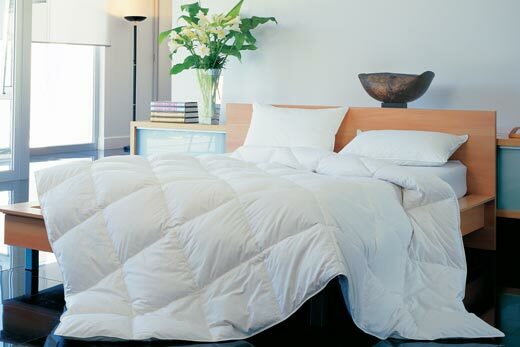 The Downia Gold Collection White Goose Down Quilt is their top-end product. This means it comes with a top-end price, which is to be expected with a down and feather quilt. Their Gold Collection White Goose Down Quilt features a minimum 85% white goose down cluster, and a maximum 15% small feathers. Not only does this ratio make it suitable for autumn, winter and spring, but you’ll avoid a poking sensation that you can get with a feather-filled quilt. This is helped by the down-proof 330 thread count 100% cotton casing. For your money, you’ll get a 10-year guarantee and it’s fully machine washable for easy care. Customers reckon it’s worth every cent and praise its high quality, lightness and warmth. We’re big fans of MicroCloud hotel-quality products, like their mattress toppers. Their quilts fall firmly within the affordable category, with their most expensive option being $300. This affordability doesn’t compromise on quality or luxury. You’ll enjoy a soft 100% Japara cotton casing, known for its durability and silky feel. Unlike heavy-feeling wool, these quilts feel lightweight. 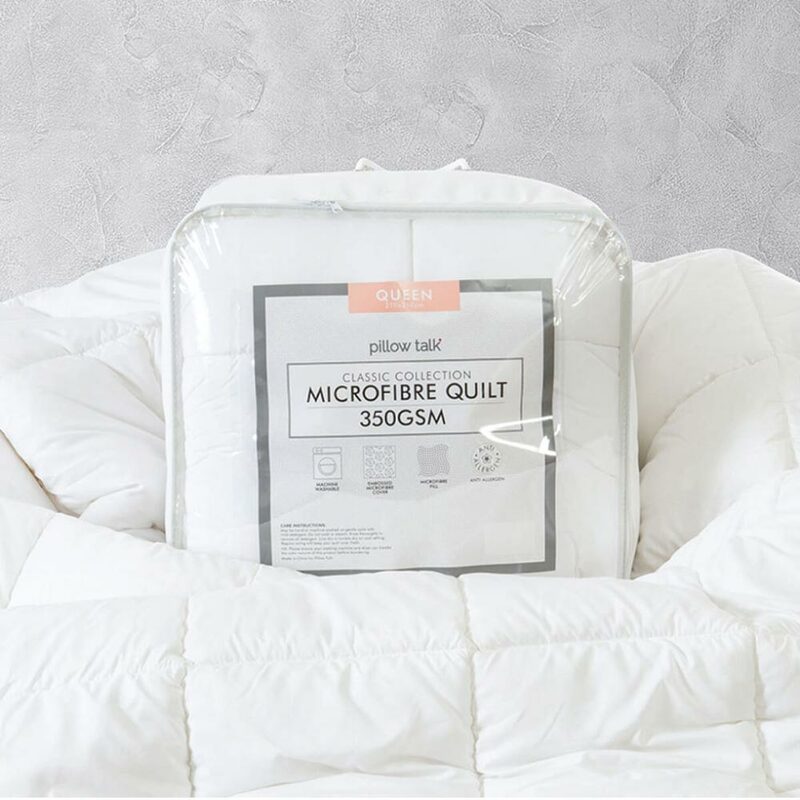 MicroCloud quilts are breathable, hypoallergenic, odourless, anti-microbial and dust mite resistant. This makes them a good alternative to animal products, such as wool and feathers. Plus, they’re machine washable and tumble dryer safe so they’re easy to care for. Customers love how the quilts feel like soft, fluffy clouds and their great temperature regulation, making them a good year-round choice. We reckon they sound like an affordable luxury. Pillow Talk consistently produces top quality bedding products for an affordable price. Like their Classic Collection 350gsm quilt. They reckon it’s the softest quilt you’ll find. The microfibre fill is hypoallergenic, making it suitable for allergy sufferers. The 350gsm weight makes it feel warm and comfortable, without feeling heavy. Due to its weight, it’s a great winter quilt. Bonus – it can be hand or machine washed for easy care. Customers rave about how soft and comfortable they are, and cosy for winter. If you’re looking for a very affordable microfibre quilt (the most expensive option is under $100), we reckon you can’t go past this Pillow Talk one. Forgive the mouthful of a name and you’ll enjoy a 100% pure new Australian wool quilt from this 100% Australian made and owned company. 500gsm of pure Australian wool is covered by a 400 thread count sateen cotton cover. This gives you a warm, luxurious quilt. Wool can adjust to your body temperature, keeping you warm in winter and cool in summer. Which backs up Halcyon Dreams’ suggestion that you can use this quilt year-round. You can choose dry clean only or machine washable. You’ll pay a bit extra for the easy-care nature of a machine washable quilt. Customers are super impressed with Halcyon Dreams’ customer service plus the luxurious quality of the quilt. We love how the quilts are proudly Australian-made, without the hefty price tag. A fairly new material entrant for quilts is bamboo, although it’s gaining in popularity as bed linen material choice. ettitude specialises in bamboo fabric sleep products. Their Bamboo Whitehaven Quilt / Duvet is organic and all-natural. It’s covered in a superfine bamboo fabric for a soft, silky feel. It features pure organic bamboo inside and out. This makes it breathable, thermoregulating, antimicrobial and hypoallergenic. The quilt comes in 2 weights: summer, 7.5 togs with 200gsm filling. Winter, 13.5 togs with 400gsm filling. So, you won’t get a year-rounder quilt although you can easily layer blankets on it to give extra winter warmth. You’ll get a winter weight queen-sized quilt for around $250. The baffle box stitching helps prevent the filling move around. Customers love how luxurious this quilt feels and its lightweight, soft feel. 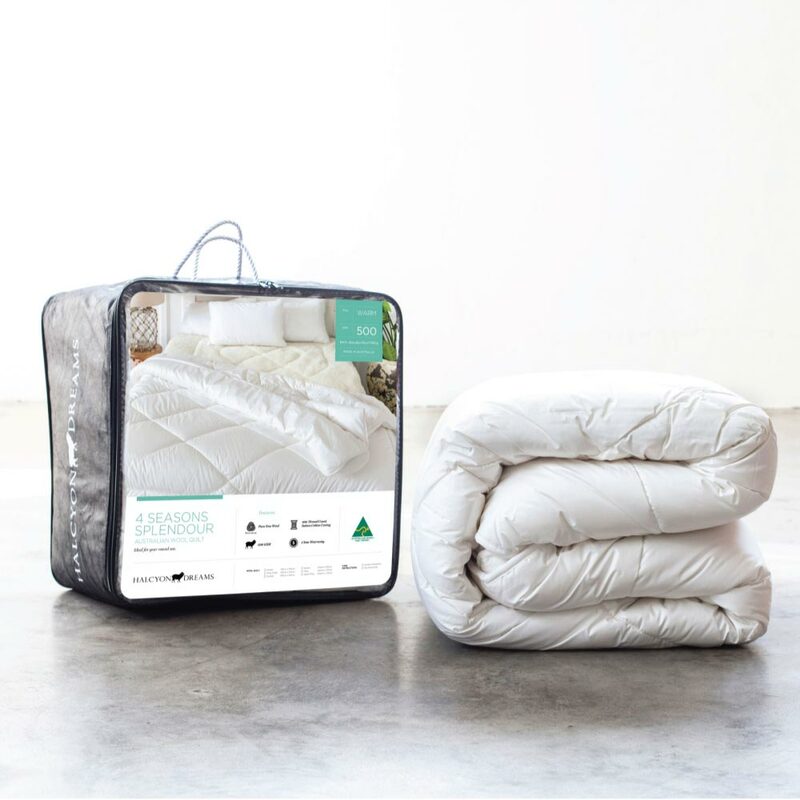 If you’re eco-conscious, have allergies or would like to try a non-traditional quilt filling, the ettitude Bamboo Whitehaven Quilt / Duvet could be for you. As well as our own research into top considerations, we’ve chatted to Debbie Farrell, Bedding Buyer for Pillow Talk. This gives you expert-backed advice to help you shop for the best quilt for you. Different quilt fillings offer different feels and qualities. A natural material, wool is breathable, which helps to regulate your temperature. This means it keeps you cool in summer but warm in winter. It has a heavy feel and a range of warmth ratings, making it suitable for different seasons and heat preferences. It’s also good for allergy sufferers. Feather and down are also natural materials, with a high warmth rating. Which means it’s suitable for cold sleepers. Look for a higher percentage of down for a warmer quilt. Feather and down retain heat and insulate well. This gives a warm feeling without the heaviness of wool. Goose down provides more warmth than duck down. Check the feathers and down are ethically sourced. Microfibre is manmade. 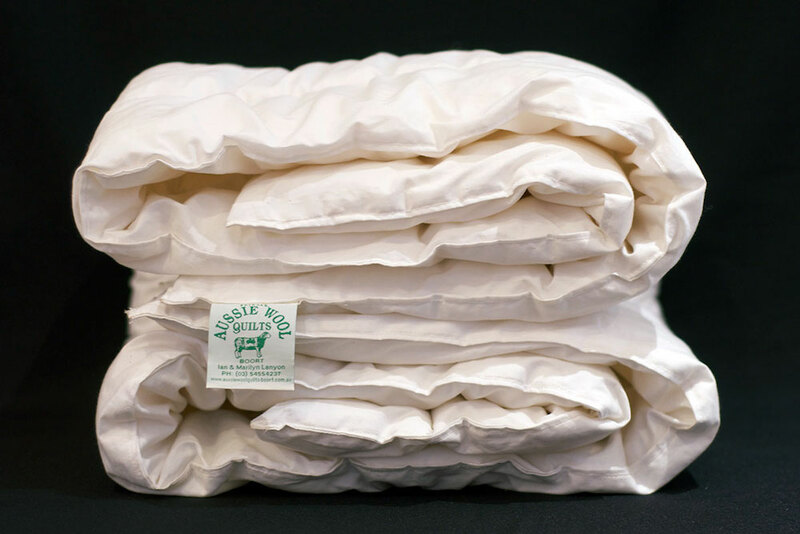 It offers medium to high warmth, making it good for cold sleepers. It’s designed to mimic the properties of feather and down without the animal product and potentially ‘pokey’ feel. Microfibre quilts have a light and lofty fill. They look great on the bed because the filling is evenly distributed. They’re also suitable for allergy and asthma sufferers. Cotton is a natural breathable fibre. It’s low warmth, so good for hot sleepers. Cotton is suitable for allergy and asthma sufferers and is easy care as it’s tumble dryer safe. Bamboo provides moderate warmth. Naturally breathable, it helps to regulate your temperature. It’s also hypoallergenic and antibacterial. Whether you sleep hot or cold will determine the best quilt for you. 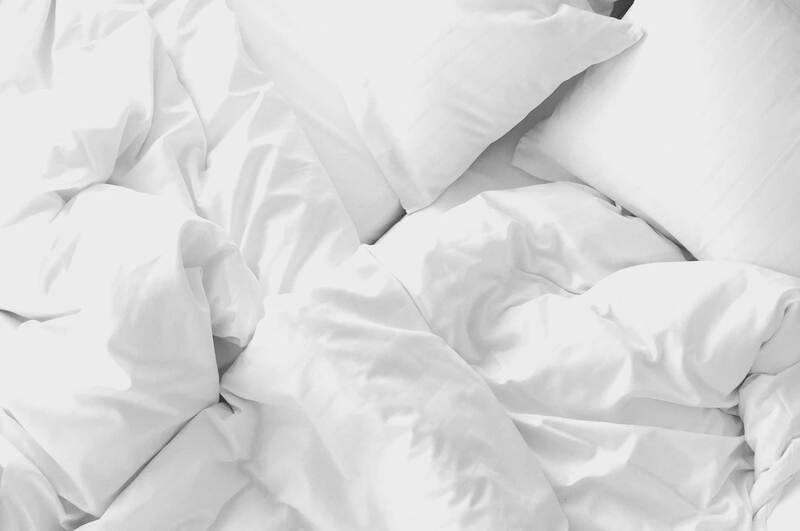 If you’re a hot sleeper, choose wool or cotton. Wool is breathable and regulates your temperature. It’ll keep you cool but a partner warm. Cotton doesn’t retain much heat so it’s a good summer option. Feather and down or microfibre quilts will retain heat by providing warm insulation so you’re best to avoid them. If you’re a cold sleeper, choose feather and down, microfibre or wool. Feather and down and microfibre quilts retain a lot of heat, making them great for winter. Although wool will regulate your temperature well, if you’re a cold sleeper choose one with a few layers of wool for extra warmth. Cotton doesn’t retain heat at all so that won’t work for you. If you have allergies, you’re best with a wool or microfibre quilt. Wool is hypoallergenic and the best ones should be chemical-free. Microfibre will give you a light and lofty feel while also being safe for you. Steer away from feather and down, especially if you suffer from hayfever. When you have two people in a bed, it can be more difficult to find a quilt that suits both people perfectly. As a very general rule, women are often much cooler than men. This is where natural fibres work best. This is because natural fibres absorb warmth from one person and either expel it or evenly spread it across to where it’s needed. Which natural fibre you choose is a very personal choice but wool, feather and down, bamboo and cotton are all great choices. How often your quilt needs to be laundered is an important factor to consider. Quilts with a natural filling should be laundered sparingly as each time you do you’re reducing its lifespan. Quilts with a natural fill are best refreshed by airing on the clothes line in the sun (or partial sun) for a few hours each week. If you’re buying for your child, choose a synthetic quilt because they’re easy to wash if an accident happens. Looking for that perfect pillow? 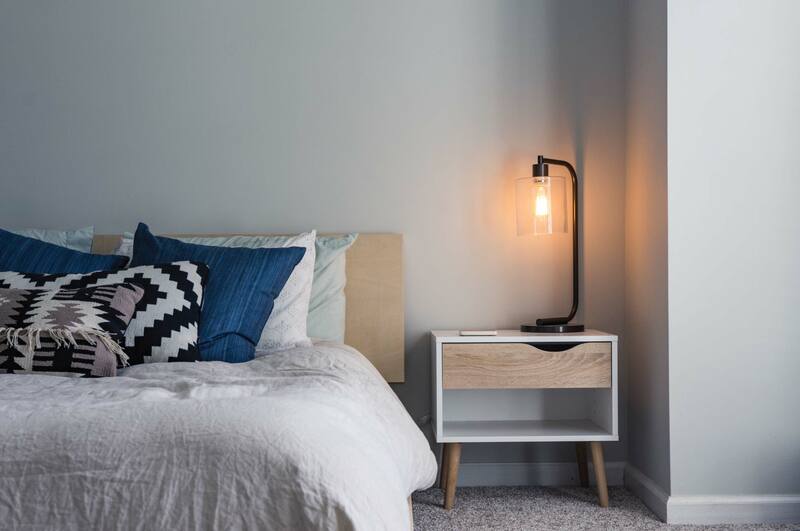 Forget slogging around the shops, here’s a round up of the best pillows in Australia you can buy online.